We stayed at the Tamaran for a week on a self catering basis. The location was great with restaurants and bars within close proximity and the Yumbo Centre was only a 5-10 minute walk away. 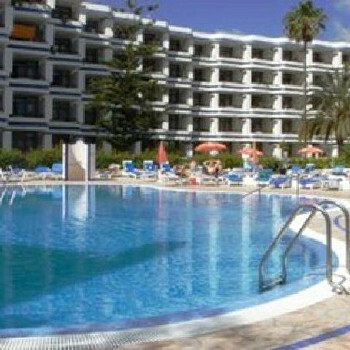 The pool was very clean and relatively quiet so no fighting for sunbeds, lifeguard on duty 10am-6pm everday who was particulay helpful. The maid service was limited and waited 4 days before any clean towels arived but were told this was due to not being awake, we were up at 9am most days so not sure how true this was, however the maid did come when we complained with clean towels and cleaned. If you come in late the door is locked and your questioned what room etc which isn't a bad thing. There is a disco underneath open until 5am so I'd avaoid the ground floor although not ridiculously loud. There is an on site shop and snack bar. I would definately stay there again due to location and the relaxed atmosphere and my only negative comment would be the maid service although other guests told me that they had a maid service most days (maybe we were just fogotten). The guests wee mainly couples. If you get chance visit Moby Dicks over the road for great food. Your a bit out of the way but perfect if you dont mind a bit of walking. It's close proximity to the Yumbo is great although avoid the Yumbo if your homophobic as it is tailored to predominately gay people but there are some great bars and restaurants at Yumbo ideal for couples and families and the Yumbo is far more relaxed for an evening out with not a tout in trying to drag you in a bar. Arrived late after a night flight, we were dealt with by night reception staff quickly. Got to the room which was clean and tidy with no problems. Very quite during the day with 6 people max by the pool which had a life guard on duty 9am until 6pm everyday. Fabulous break. Very clean, quite and relaxing. Ok no entertainment but plenty in close proximity. The cleaners are very thorough and artistic, folding towels in a very creative manner swans, hats etc. A rosette made out of toilet paper in the bathroom! Would definitely return and highly recommend. Visited these apartments Oct `06. However, I found it to be clean spacious & well equipped with micro, coffee-maker, toaster, hair-dryer, TV & a small radio. We had no problem whatsoever with hotel-staff & found the maids to be thorough & friendly. The location was great.. right in between beach & Yumbo, the Cita-Centre is just round corner & this had a club that opened at 6am-10am...I found this fantastic! I would definitely return to these apartments. We have been to the Tamaran the past 4 years and each year it gets better and better with upgrading to the apartments each year. Staff are really nice. There is a lovely wee cafe in at the main reception which I can highly recommend. There is no entertainment in the apartments but there are a couple of bars near which are worthwhile going to. We stayed in the Tamaran apartments in Sept 06, the rep didnt sell it to us as a 2* apartment. The apartment was clean but the floor was dirty, accomodation in a good location but should only be used for somewhere to sleep. The pool was busy and you needed to get out early to get a bed. Reception staff very rude and unhelpful, tour rep useless. The Tamaran Apartments are clean, spacious and in a great location in Playa Del Ingles, only 10 minutes from all the centres and the dunes....BUT... i would definately not recommend these apartments! Whilst the apartments themseleves wer overall quite nice, although lacking in a toaster and microwave, our main problems were with the staff. 4 days into our holiday when we came back 2 the apartment one of my room mates accidentaly snapped the room key (dont get me started- totally rubbish design and easy 2 break in the slot). It was about 4 oclock in the morning and some ppl had arrived in reception to check in. The receptionist was particularly rude and forced my friends to wait nearly an hour for a new key. He was telling the guests checking in that my friens were idiots 4 breaking the key, although earlier in the day we had seen someone else swap a broken key with ease. If this wasn't bad enough the following night we returned earlier than some of our other friends. One of the friends with me was diabetic and realised that his insulin was in one of the other rooms, and he would need it. He went down to reception and yet again was encountered by the same receptionist. The receptionist refused to give him the key even though he knew full well that we were all in the same party. He told my friend that he was wasting his time and should have taken the keuy with him. This receptionist seriously endangered my friends life, and could have very easily accompanied him to collect the insulin. There would have been no issues if the Tamaran had supplied parties with more than one key as of course not everyone goes out at the same time. We also encountered another problem, this time with the maid. We had been out at the beach, and returned to find our door of our room wide open. This was about 6 oclock and the maids cleaned around 1- this meant that the maid had left our door open 4 nearly 5 hours!! in this time we could have had all our belongings stolen, and if it hadnt been for the room key the maid had left in the electricity holder, if we had been burgled it would have been seen as our own fault. My recommendation is to definately have a safe as the maids cannot be trusted (they also liked to move things around) and if you can avoid the Tamaran at all costs due to there very RUDE staff! Tamaran may be good for families but for groups of young people its a definate no go! I had a class holiday and am going back next year, however doubt I will be going back to this hotel. Our hotel room got cleaned twice during the whole holiday and this was only because our rep, Shelly made the cleaners. The cleaner pinched my bag which had my camera and money in, there was also other complaints in the hotel about cleaners pinching things out of peoples bedrooms. The reception staff were just plain rude to be honest they were not helpful at all and just whinged at you about everything. I once got an half hour lecture because I walked into a door when I was drunk. Thankfully we had a great rep in Shelly, unfortunately she left after 10 days to move to another hotel. The pool area was great however and you didn't get wrong for drinking around the pool or for taking inflatables in, god knows we had enough! Like I say I am going back to Gran Canaria next year but to a different hotel because at the end of the day the only reason we had such a great time staying in that hotel was because of the other people who were staying their who were wicked. When we booked this holiday was dreading what I was going to find as it was only a 2*. I looked at the reviews and most were positive which was a relief. When we arrived I found the receptionist a bit rude and treated us like children. Apart from that they seemed OK but there was a couple of staff who seemed grumpy. The maids came in everyday and linen was changed twice a week. There wasn't any entertainment apart from a pool table and computer. There is however a brilliant little pool restaurant which is great value for money and the staff are really friendly. The hotel is based in an ideal location, within walking distance of the Yumbo (which is a must) if you dont like walking taxis are really cheap. I would definitely return to both Gran Canaria and the apartments as it was the best holiday I have ever had! Apartments were clean tidy and quite spacious. One thing i would say though is that some people mentioned rooms with / without microwave and toaster. when we booked there was the option of a normal or superior room - with the superior room having a few extras as above plus iron and ironing board. reception staff very helpful, as were security staff of a night - very secure apartments. cleaners were in regular as state din brochure and were always polite and friendly. rep Shelly was really helpful as well. overall apartments are clean, tidy, and within walking distance to eveything you could need.